Bits of Torah Truths, פרשת כי תבוא, Parashat Ki Tavo, What Kind of Relationship is this? This week’s Torah Portion is a very important one, in which Moshe says הַסְכֵּת | וּשְׁמַע יִשְֹרָאֵל הַיּוֹם הַזֶּה נִהְיֵיתָ לְעָם לַיהוָֹה אֱלֹהֶיךָ “Pay attention, and hear O Israel, on this day you have become a people to God, your God.” The reason this week’s Portion is so important is its relation to what it means to be “a people belonging to God?” Moshe and the Priesthood are saying to the people, you actually have a relationship with God. Our relationship with God is not just in word, but is also in deed (how we live your lives). To summarize Devarim / Deuteronomy 26:1-29:8, Moshe instructs the Israelites regarding the first fruits offering; Moses then lists the blessings for keeping the commandments and the curses for disobeying them. These things are related to a choice that is presented to all of us, whether we will choose to follow what God commands, or reject it. Whether we choose to humble our lives before God and men, or pridefully refuse. The question is, “if a person chose not to follow God’s laws or to walk in God’s ways will he still belong to God?” This is a very important question for us today as it is related to the blessings and the curses listed here in the Scriptures. Do you believe God sends blessings and curses to His people? Has the Lord God blessed and cursed you in your life? If so, how, and if not, why? These are important questions because the Scriptures state on the one hand, “If you listen to God and carry out God’s commandments, the Lord God will set you above all the nations of the earth. You will be blessed in the city and in the field. Blessed will be the fruit of your body and the fruit of your soil and the fruit of your livestock. Blessed will you be when you come in and when you go out.” And on the other hand, “But it shall come to pass that if you will not listen to the voice of God, nor carry out God’s commandments that all these curses will come upon you and overtake you.” These are serious statements that need to be considered. Modern theologies today however reject what is written here as having any place in our lives today. The basic premise comes from what we read in Galatians 3:13 Christ redeemed us from the curse of the Law, having become a curse for us for it is written, ‘Cursed is everyone who hangs on a tree’ 3:14 in order that in Christ Jesus the blessing of Abraham might come to the Gentiles, so that we would receive the promise of the Spirit through faith. (NASB) Theologies, such as Dispensationalism, have been developed in order to neglect what we are reading here today in Parashat Ki Tavo. It is important to understand what the curse of the law is and what the blessings of Abraham are as they are related to us. Without understanding these things it is possible to make up anything for the purpose of redefining the meaning of God’s word. The Bible provides us the answers in Deuteronomy chapter 28. What exactly is “the curse of the law” which Yeshua the Messiah has redeemed us from? Any preacher you speak to today regarding the blessings and the curses, will state the curses do not apply or are irrelevant because we have faith in Jesus Christ. What follows then is the claim of legalism in relation to the blessing and the curses, coupled to Galatians 3 saying those who keep the Law of God are involved in legalism. In the Torah portion, Moshe reminds the people that they are God’s chosen people, and that they, in turn, have chosen God. As a chosen people, Ki Tavo lists the blessings of God followed by the harsh account of the bad things “illness, famine, poverty and exile” that would befall the people if they abandon God’s ways. Note how this is what Paul was saying in 1 Corinthians 11:27-32. We have to remember the Scriptures say disobedience is sin, and obedience is righteousness. 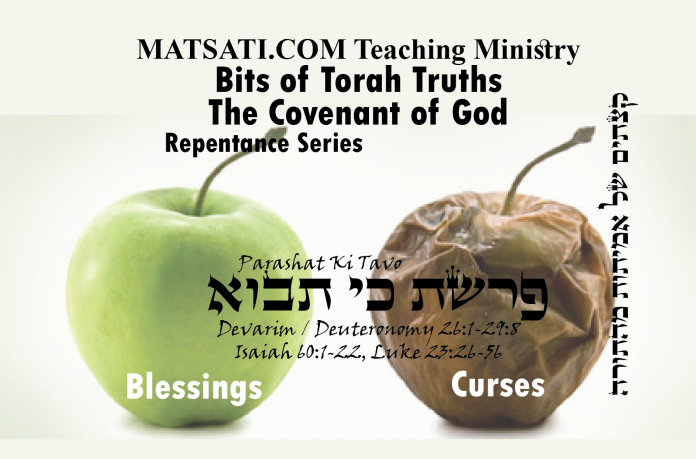 The point is if a person is living in unrepentant sin, does Yeshua redeem him from the consequences? The modern theological conclusion, is yes because we are saved by faith alone. But, was this the conclusion Paul was making, while speaking to the point of Gentile inclusion as the people of God? (see Acts 26) Moshe concludes the portion by telling the people that forty years after their deliverance from Egypt, they attained “a heart to know, eyes to see, and ears to hear.” This is about our becoming aware of our sin and need for a savior. Modern theologies state “God’s favor is bestowed upon believers through faith in Christ alone, not through performing the works of the law as stated in Deuteronomy 28.” What kind of relationship does this describe where all one must do is believe? The interesting point is Paul taught in Acts 26:20 but kept declaring both to those of Damascus first, and also at Jerusalem and then throughout all the region of Judea, and even to the Gentiles, that they should repent and turn to God, performing deeds appropriate to repentance. (NASB) Paul wrote we are to do works (deeds) which are appropriate for repentance. Does this modern theology of faith alone declare something contrary to what Paul is saying? The deeds (works) Paul speaks of have not radically changed between the Old and New Testaments. This is the confusion of modern theologies today which teach obedience to the Torah was a form of legalism. In addition, it is important to note the list of curses are more numerous and detailed than the list of blessings. The reason for this is we are being told, our Father in heaven will do everything that is necessary to make sure God’s people understand what it means to walk in disobedience (sin). The Lord calls us to walk in the Spirit and to remain in His mercy, which is facilitated by living a repentant life, and standing strong in the Messiah Yeshua. The Scriptures say “But it shall come to pass, if you do not obey the voice of the Lord your God, to observe carefully all His commandments and His statutes which I command you today, that all these curses will come upon you and overtake you.” (Devarim / Deuteronomy 28:15) What this week’s Torah portion is telling us is we are called to live by faith, which is the technical term for walking in the Spirit otherwise known as obedience to God’s Torah. Note how under the Torah, righteousness is bestowed as a gift in response to our faith in the God of Israel. The Old Testament and the Apostolic Writings do not present two different theological systems. Yeshua come to destroy the curse of death and to empower us to walk in God’s ways by the power of the Spirit in our lives. The modern theological distortion of the Word of God speaks contrary to God’s Torah as a way of life. Much of this comes from a wrong teaching in the church. Let’s discuss these things further in this week’s Torah portion. This week we are looking at Devarim / Deuteronomy 26:1-19, 28:58-29:1. The Torah states in Devarim / Deuteronomy 28:16 הַיּ֣וֹם הַזֶּ֗ה יְהוָ֨ה אֱלֹהֶ֜יךָ מְצַוְּךָ֧ לַעֲשׂ֛וֹת אֶת־הַחֻקִּ֥ים הָאֵ֖לֶּה וְאֶת־הַמִּשְׁפָּטִ֑ים וְשָׁמַרְתָּ֤ וְעָשִׂ֙יתָ֙ אוֹתָ֔ם בְּכָל־לְבָבְךָ֖ וּבְכָל־נַפְשֶֽׁךָ׃ 28:16 The LORD your God commands you this day to observe these laws and rules; observe them faithfully with all your heart and soul. (NASB) Notice how the Scriptures say we are to be faithful in our lives before God (“observe faithfully”). This is how we can say that we actually have a relationship with God, which is an interaction between two persons. Our relationship with God is not just in word, but is also in deed. In order to bring this into context, the Psalmist describes the joy of God’s Torah as a way to not be ashamed and for relying upon the Word of God for the uprightness of the heart. Note how the Torah is described as the testimony of God. We are called as God’s people to bear the testimonies of God. Do the modern theologies that minimize the points being made in the psalm say these Scriptures were only for the time period in which they were written? The book of Revelation speaks of the importance of bearing the testimony of God within the context of eschatological (end time) events. The psalmist connects the Torah to the one whose way is blameless as being blessed, and says this is the one who walks in the Torah of the Lord. It is interesting how much of a contrast this is to modern day theologies being taught in the Christian church today. The psalmist however claims the Law of God (Torah) is a favorable approach to being blessed of God and living a blessed life. The correct translation of the word Torah is “instruction” or “revelation,” as in “God’s instruction,” or “the revelation from God.” This is how the Torah is presented in Judaism due to the root word יָרָה meaning “to teach.” The Torah is the revelation of the character of God as well as His instruction of what is to come for the life of the one who places his faith and trust in Him. The Torah is God’s instruction on how those who place their faith and trust in Him, either Jew or Gentile, are to live so that all will be well with him (Devarim / Deuteronomy 4:40). The Scriptures says (Shemot / Exodus 12:48-49, Vayikra / Leviticus 24:22, Isaiah 56) that God’s instructions are not just for the Jewish people. The prophetic visions of Isaiah (Isaiah 2) speak to this truth, where the Gentile who chooses to be a part of God’s people will live by His truth. This is a consistent theme throughout the Apostolic Writings. The Lord chose to reveal His ways through the Jewish people, they were to be a light to the world and bring this revelation of God to the nations. Yeshua reminds us of this in the words he spoke in Matthew 5. These things are consistent with Tehillim / Psalms 119:159 which states “Consider how I love your precepts; revive me and give life to me, O Lord, according to your lovingkindness (grace, mercy, כְּחַסְדְּךָ).” David’s words in Tehillim / Psalms 119 speak of his asking for salvation, and that the Lord would give him life, so that he could follow in the way of the Lord according to His Torah. The Lord Judged David based upon his faithfulness to the Lord and his desire to walk in His ways. David’s faith resulted in the desire to follow the Lord and His ways. Do you have this kind of faith? The connection of man to the Lord in heaven is made through three Hebrew words which over time developed the meaning of “soul” in the Tanakh as Neshamah, Nefesh, and Ruah. Tracing the development of these terms gives us some idea of the ancient Israelites’ beliefs regarding the soul. The Sages speak of the dangers of the soul (neshamah), the natural and depraved part of our being, the base nature, which has the capacity for evil and unrighteousness (i.e. the flesh). They speak of guarding the mouth because what we say comes from our hearts. The soul is described as testifying against us. The soul appears to be that which leads a man to his actions, which is why the Sages describe “A person’s limbs testify against him…” Tur HaAroch describes this in the following way. את ה’ האמרת. שכיון שקבלתם עליכם כל התורה בפירושיה ובדיקדוקיה גדלת השם ורוממת אותו שיהיה הוא לכם לאלהים ולא תודו לאל אחר: את ה’ האמרת, “You have exalted Hashem,” by accepting the entire Torah in all its details you have exalted Hashem this day; you have adopted Him as your exclusive G’d, eschewing all others. וללכת בדרכיו. לעשו’ הטוב והישר והזכיר החוקים והמשפטים בפרט כאשר פירש ויכלול במצותיו כל המצות עשה ולא תעשה: וללכת בדרכיו, “and to walk in His ways.” To not only perform His commandments to the letter, but also to model yourself according to what He has revealed about Himself, i.e. to go beyond the letter of the law and to honor the spirit upon which the law has been based. ולשמוע בקולו. כל אשר יצוה לכם משאר המעשי’ על ידי ועל ידי שאר הנביאי’: ולשמוע בקולו, “and to hearken to His voice.” Any other matters He will command you through me, even if they are not part of the basic 613 commandments. The commentator speaks of the one who accepts God’s commands has exalted the Lord, and of the importance of going beyond the letter of the law to the spirit upon which the Torah has been based. These are the things Paul was describing in Galatians 3. There are a number of things that jump out for us here in the text from Galatians 3. Paul is speaking of gentile inclusion in faith in the God of Israel. He speaks of the curse of the Law being the result of man not being able to keep the commands. Paul says the Law is not of faith, the reason being, the performance of the command is something that is lived, it is tangible, something that may be taken hold of and applied to life in a practical way. Faith is something that we believe and is an intangible thing where faith being lived out is practical when taking in the context of the Torah. Paul writes we are redeemed from the curse of the Law, not from the Law itself. The curse of the Law is related to the consequences of one’s inability to obey the commands. Paul is making an argument for gentiles, and not about neglecting God’s commands. The Apostolic Writings state Yeshua became a curse for all peoples, so we are to have faith believing, and being justified due to Yeshua’s righteousness. This is so prophecy may be fulfilled (i.e. Isaiah 2), and so the gentiles may also partake in the promises of God. The point Paul is making is in relation to faith and action. Faith comes first and action comes second as a result of the Lord working in our lives because of our faith. Paul speaks of the divine inspiration of the Torah (Galatians 3:19). The culmination of his argument he states, 3:21 Is the Law then contrary to the promises of God? May it never be! For if a law had been given which was able to impart life, then righteousness would indeed have been based on law. 3:22 But the Scripture has shut up everyone under sin, so that the promise by faith in Jesus Christ might be given to those who believe. (NASB) He is saying the reason Scripture has shut up everyone under sin was so the promises by faith may be given also to all people, to those who would believe. Take note again how Paul is drawing upon a gentile context, Paul is making an argument for Gentile inclusion. He is not saying we are exempted from obeying God’s commands. Akeidat Yitzchak 98:8 draws these things into context stating the following. The Jewish nation’s stature as a princess amongst the nations of the world, flows directly from its subservience to its G’d. (Deut. 26, 17-18) “You have acknowledged G’d this day…and the Lord in turn has acknowledged you.” Our greatness is due to our having enthroned G’d as our Sovereign. There are four areas in which subservience to G’d has to express itself. 1) Since everyone has a tendency to want to be his own master, irrespective of the benevolence of any authority he may find himself under, the Torah states that “you have expressed the wish that the Lord be with you.” (26,17) 2) Man does not like to be thought of as a carbon copy of someone else, nor to imitate someone else, robot like. He feels that by doing that he deprives himself of all originality and that he will never be thought of as an independent individual. Man desires to receive credit for action stemming from his own initiative. The book of Kohelet is full of emphasis of the originality of its author’s thinking. “I thought,” “I did,” I concluded” etc. Note how the commentary speaks of our having acknowledged God and He having acknowledged us, and that we have enthroned the Lord God as our Sovereign. This speaks of humility, of humbling our lives, and of being submissive to God and His commands in our lives. If we reject the righteous and holy ways of God, what kind of relationship do we really have with the Lord? The commentary states that everyone has the tendency to be his own master. This is why one chooses not to obey the Word of God in his life. The point of our faith is to the expectation that the Lord will be with us. To say that we only have to believe in the Lord God in heaven and in His Messiah, does nothing to enthrone Him above as sovereign over our lives. This is accomplished however by our desire to mimic our lives after God’s ways. This is what comes out of our pondering upon the mutual nature of our relationship with God. Faith that is lived out is where the commandments come into play, these things are related to our relationship with God! This week’s Torah portion states in Devarim / Deuteronomy 28:16 הַיּ֣וֹם הַזֶּ֗ה יְהוָ֨ה אֱלֹהֶ֜יךָ מְצַוְּךָ֧ לַעֲשׂ֛וֹת אֶת־הַחֻקִּ֥ים הָאֵ֖לֶּה וְאֶת־הַמִּשְׁפָּטִ֑ים וְשָׁמַרְתָּ֤ וְעָשִׂ֙יתָ֙ אוֹתָ֔ם בְּכָל־לְבָבְךָ֖ וּבְכָל־נַפְשֶֽׁךָ׃ 28:16 The LORD your God commands you this day to observe these laws and rules; observe them faithfully with all your heart and soul. (NASB) The Scriptures state we are to be faithful in our lives before God (“observe faithfully”). However, as God’s chosen people, if we choose to live in unfaithfulness, Ki Tavo lists the harsh account of the bad things “illness, famine, poverty and exile” that would befall us if we abandon God’s commandments. The point of the New Testament writings is on what Paul spoke of, we are to do works (deeds) which are appropriate for repentance. The modern theology of faith alone speaks contrary to what Paul is saying because we are called as God’s people to seek His righteousness in our lives, by humbling our hearts and walking in His ways. The deeds (works) Paul speaks of have not radically changed between the Old and New Testaments. The confusion of modern theologies today which teach obedience to the Torah is a form of legalism, is off base when in fact the Torah is a way for us to love and honor God in His Word!